As you’re probably aware from the last post, I’m hard at work on a Mandatory Upgrade novel. I’ve sent out an update on that project to my followers on Inkshares and so I’d like to also send that update out to you. 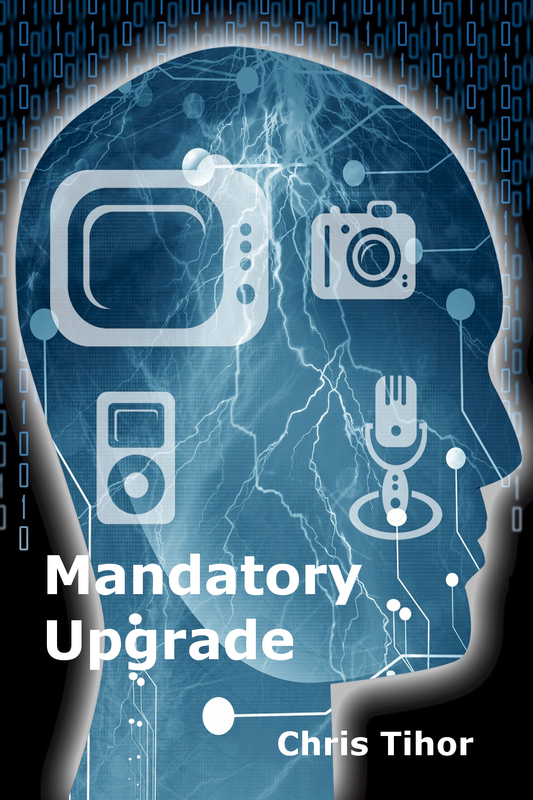 If you’d like to find out more about the Mandatory Upgrade novel, please visit the Inkshares page for my book. If you’d really like to help me out, please follow, recommend, and/or pre-order a copy of the book. Don’t forget: as mentioned in the update everyone who pre-orders the novel gets a free copy of the game and my everlasting appreciation. Without further ado, here is the update in its entirety. First off: Thanks to everyone for your support! I couldn’t do this without you. I’ve been delayed in getting this first update out as I’ve been busy doing some final polish on my game Mandatory Upgrade: X Marks the Spot. If you haven’t heard of it yet, it’s an interactive mystery story game set in the same world as my novel. In fact, the main character in both the game and the novel is Rachel Varley, and part of the plot for my book will be coming directly from the game. This gives you, dear reader, the unique option of experiencing Mandatory Upgrade as both a novel and as an interactive story if you so choose. Not only that, if you’ve pre-ordered a copy of my book then to show my appreciation I’m going to give you a free copy of my game. Contact me directly and I’ll send you your code for your free copy of X Marks the Spot straight away. Of course, if you play through the demo and want to buy a copy anyway, I certainly won’t complain. Back to Mandatory Upgrade, the novel. I thought that it would be fun to talk about some of the near-future technology that will be appearing in the story. Let’s start on this update by introducing augmented clothing. Augmented clothing or “augwear” as it’s commonly referred to is the result of years of research and experimentation into clothing that enhances your physical abilities. Originally developed in the labs of military contractors and sports gear manufacturers, augwear has found it’s way in a lesser degree into the consumer market. Augwear uses reactive cloth that is controlled by embedded specialized computers and synchronized to the wearer’s physiology through an array of bio-sensors. The outfit’s material responds to the wearer’s movement, constricting and releasing in concert with their muscles to enhance strength and agility and create a kind of kinetic feedback loop. The easiest way to describe this is to imagine wearing a form-fitting yet flexible bodysuit and going for a brisk walk. The elastic tension of the suit gives you what feels like a slight boost to your motion. Now imagine that magnified ten times and you can start to get the idea of what wearing augwear can feel like and why it has become so popular in the future. The augwear I’ve described would be the base model with a variety of add-ons and enhancements available for both the private consumer and the law enforcement or military professional. As you can imagine, a popular option is to add an extra layer of protection to the outfit in the form of gel-packs, padding and hard shell armour. Other options include integrated augmented reality, vehicle and drone control rigs. Video displays and cosmetic lighting effects are also popular, as well as having the capability to define touch control schemes on any part of your outfit on the fly. Why mess with digging out your cellphone when you can type up and send a quick email on a pop-up interface on your forearm? This is just scratching the surface to give you a quick taste of the technology, but I’ll be getting into it in more depth in my story: both in outlining the capabilities of the augwear systems and the impact it has on our society. In future updates, I’ll be getting into other technologies as well. In the meantime, thanks again for your support and if you can spread the word about my book to other folks who might be interested I would appreciate it immensely. Besides, the more people we get on board with pre-orders, the greater chance that we can get this book finished and published for everyone to enjoy! Mandatory Upgrade Coming to Story Stylus!